Dr. Gugliotti presents a no holds barred account of someone facing Cancer and dealing with it on his terms. His chronicle gives a detailed insight of his fight from the first moment he went to the doctor for a persistent cough, to the diagnosis of Hodgkin’s Lymphoma and the ensuing battle to beat the disease. It is a well thought out presentation depicting many aspects of his struggle from the physical to his inner personal strength and support of his family and friends. Dr. Gugliotti is a testament of true faith, courage, and devotion. His overwhelming sense of trust and pride radiate off the pages of this book and you can not help but feel your own heart and emotions being abundantly filled. Dr. Gugliotti is an inspiration to any adversary and has wisely taught that through patience, unclouded judgment, hope and above all else support and love ANYTHING can be accomplished. 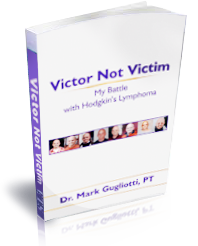 Dr. Gugliotti shares his personal journey and “Victory” over his battle with Hodgkin’s Lymphoma in this easy to read, well written book. Victor Not Victim is a wonderful testament of courage, inspiration, hope, and love. Above all, Dr Gugliotti continued through his journey with a positive attitude and sense of humor. This book embodies the power of positive thinking and is an inspiration for those undergoing treatment as well as anyone touched by this disease. Dr. Gugliotti’s story of his battle with Hodgkin’s Lymphoma is a true account of one man’s fight with cancer and how hope, determination and love can overcome all in the trials and tribulations of life. From his first recollections of a nagging cough to the interesting dealings of radiation treatment, Mark gives an upfront no bull account of how life really is with cancer. Anyone with cancer or close to someone with cancer needs to read this book.